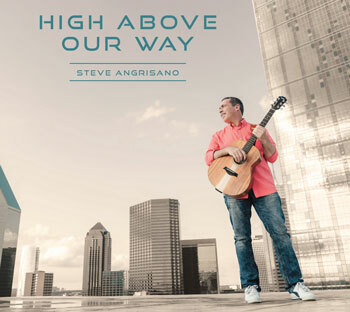 Featuring his signature gift for memorable melodies and challenging lyrics, Steve Angrisano's High Above Our Way delivers nine approachable contemporary songs for liturgy, prayer and inspiration. It has been four years since veteran composer Steve Angrisano released his last full collection. A quick listen to High Above Our Way confirms that the wait has been worth it. Once again Steve provides us with beautiful melodies, challenging lyrics and a taste of his deep commitment to a life of faith and love. Recorded in Nashville with notable producer Steve Hindalong, High Above Our Way includes all the music from Leading Us Home, along with six new songs that bring us closer to Christ. Particularly approachable and prayerful, these accessible songs feature a contemporary sound and are as suitable for liturgy as they are inspiring for personal listening. Always one for collaborating, Steve teamed up with fellow Catholic contemporary artist Curtis Stephan on a number of songs, making for a solid combination of liturgical and musical expertise. This formula for success is especially evident in “High Above Our Way,” a song that will quickly become a favorite for congregations and youth retreats. Other songs co-written with Curtis include “Exposition/O Saving Victim,” a song for eucharistic adoration that weaves together English settings of "Attende Domine" and "O Salutaris Hostia," and “More Beautiful,” an elegant piece that is wonderful for praise and worship. A couple other exciting additions include "For All Once Broken," Steve's beautiful setting of one of Jesuit Father James Quinn’s exquisite texts, and "Christ Our Light Has Come," a fantastic contemporary Christmas song that will unite young and old during celebrations of our Lord's birth. Find Steve's reflection on "For All Once Broken" here.